The days leading up to Christmas have been very busy but were set rolling in good style by Maccabees' win. A superb staff Christmas party soon followed. Then Claude Greenwood travelled to Chelmsford City, where an improved performance saw him collect some AVC prize money for 5th place. There was a large gathering for the final Saturday breakfast before Christmas, where cards were exchanged and Maccabees' victory was celebrated. 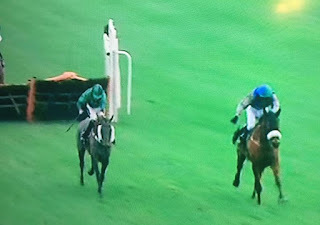 The following day Itoldyou and Kingscombe made the long journey to race at Fakenham. Itoldyou earned some AVC prize money for 6th place and James won the "Best Turned Out" award with Kingscombe. The following day saw Mabdab make his racecourse debut at Lingfield, and a very encouraging one it was being right in contention until the last half furlong and finishing 6th. Mabdab's owner, jockey and trainer at Lingfield. While Mabdab was at Lingfield, Claude Greenwood was back at Chelmsford City, again earning some prize money, this time for 4th place. There is time now for a couple of easier days before Red Anchor goes to Fontwell on Boxing Day. Having made the frame a couple of times recently, Maccabees got the victory he deserved in the long distance handicap hurdle at Plumpton today. Ridden by Tom Cheesman he settled in the rear half of the nine runner field for the first circuit then closed up going down the hill for the second time, taking the lead into the straight. He possibly didn't want to be there that early and Tom gave him a breather up the hill, allowing the field to close. Again going down the far side he started to stretch them and by the turn into the home straight there was only one to worry about. It was a good battle over the final two flights but Maccabees always looked as if he would just hold on, which he did winning by 1 and a quarter lengths. Co-owner Kim (left) with Maccabees. 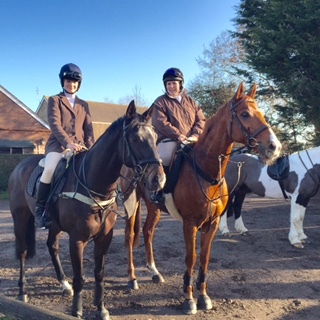 Linda has sent Red Anchor and Claude Greenwood to a local hunt to keep them happy and hopefully freshen up their performances. Certainly with Red Anchor it did the trick earlier in the year. Valence Racing member Penny was on hand to see them.